Having trouble paying your bills? Are you getting overdue notices from your creditors? Are your accounts being turned over to debt collectors? Are you worried about losing your home or car? If so, you’re not alone. 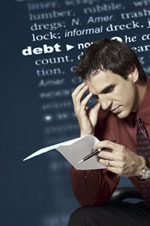 Many people face financial crises at some time in their lives. Whether the crisis is caused by personal or family illness, loss of job, or simply spending too much, it can seem overwhelming. But often, it can be overcome. It depends on how much debt you have, how dedicated you are in paying off your debt, how much debt you can handle, and your prospects for the future. So, how do you decide how much debt you can handle? One way is to see how you feel about having one more bill to pay. Will you stay awake wondering how you’ll pay it? Will you worry that you might not have enough money to pay the bill when it comes due? This is the comfort test. If the bill can’t pass this test, don’t take it on.